Hi Diane, I got the painting in the mail yesterday – and I love it! I always open it up after I do all my errands (feed the cats etc.) when home from work, and then I put it up so I can look, look, look at it!!! I have to say it is one of my very favorites… I say that about each or your paintings, but it is really special… and I love the black cats >>^..^<< - Deborah H.
Yesterday we received with pleasure your painting. It is obvious that you do everything in your life with exactitude . The painting was wrapped in a meticulous fashion , with even a colorful ribbon ! It was protected and emerged in perfect condition. We also appreciated your little note. The painting was immediately hung in a prominent place in our dining room which also features pictures of a beach and a water scene. It seems to blend in perfectly with these nature scenes. 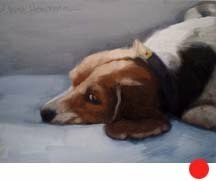 The painting is even more attractive " in person" and really looks like the sturdy body of our beloved Chance. -Diana V.
I just opened my package with "Binky" inside and I am overwhelmed it is so beautiful. You are a true artist. I just love it! The whole presentation - packaging, beautiful note, wrapped with a pink ribbon - and ready to hang! So pleased. -Georgia S.
maybe a cat or two) -Mark A. My cousin called me - had to get my phone number from another cousin. She was nearly speechless, she said - she was so surprised and happy to receive the painting!!!! It was all such a happy event!!! 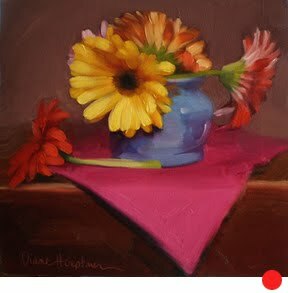 - Audrey H.
"I came across your blog today randomly searching for pictures of zinnias --- your work is lovely! The amalgam of art deco textures and rich expressionism is truly gifted. Floral and feline perfectly paired. As a former gallery manager and Art historian, it's sincerely wonderful to have the opportunity to see Saint Layla everyday." -- Kelly S.
I love it!!!!!!! Tamar of www.ihavecat.com Interview with Diane here. "The paintings have such a depth of realism you want to reach in and smell the flowers." 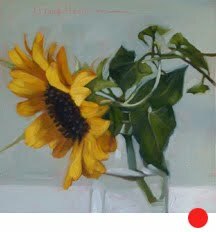 -- Catherine H.
"In all of her paintings, Diane tries to push her floral compositions to another level through her use of strong brushstrokes and careful consideration of light and dark. And as you can see, these aren’t typical paintings of flowers. . . ...But the real magic is in her soft, yet strong handling of the paint. There is something mesmerizing about capturing a flower with just a few broad strokes." Lisa Orgler for EmptyEasel.com See full review here. "My package just arrived. Everything was so beautifully wrapped cared for... ready to hang! You are a pro! 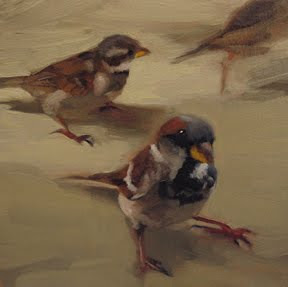 I love my sparrow painting!!!!! The single white of the eye grabbed my heart; even more in person. Thank you... I will cherish "The Brief Survey" forever!" -- Pam A. 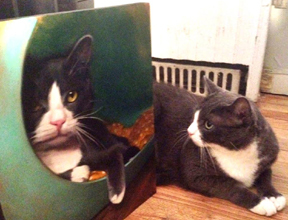 "We got the painting in the mail on monday and it occurred to me that maybe you'd want to know that! it is gorgeous~ makes me want to lick it- i love brushstrokes! 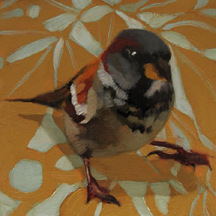 makes me want to paint in oils again- maybe this summer..." -- Kat C.
"The appeal for me is not so much the subject itself, but her relaxed painterly approach, rich with casual but luxuriant brushstrokes defining both the flower forms and vessels in which she places her subjects." Charlie Parker for LinesandColors.com See full review here. "...I try to buy pieces that make me happy to look at and that I feel I will never grow tired of looking at. 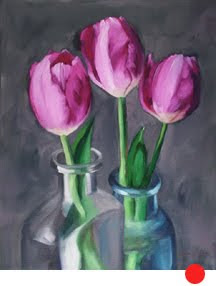 The pink and gray tulips immediately struck me as that kind of piece. The background takes on all kinds of different hues depending upon the light coming through the old dining room French doors--moody grays and blues let the pink petals and green stems pop. Thank you for this special piece." --Linda R.
"I just HAD to write to let you know how much I love - and will ALWAYS cherish - the portrait you made of my Duke! You truly captured "him" in your lovely, painterly style....every time I look at it I smile (ok that was an unplanned poem!). I - actually we all - cried when I opened the package from my sister....and though Duke is now playing with some new friends in heaven, I can have a permanent memory of him here through your special creation." -- Heidi L.
"Proud to own this little gem"
"Had a few women over yesterday and showed them my favorite paintings, and they also feel you are so gifted! Would love to have half of your artistic talent/ability. 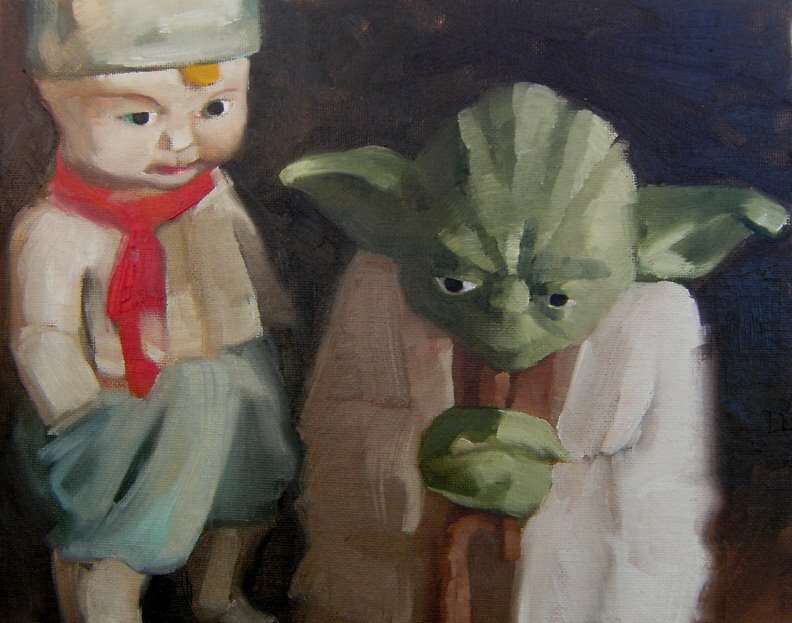 Your paintings give me such joy and peace every time I look at them." 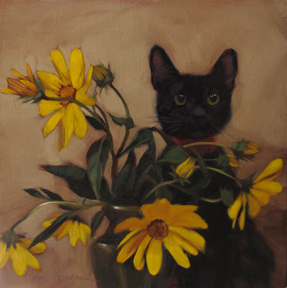 -- Marti D.
"The painting is just gorgeous; shows Petal's big eyes and her curiosity. I feel as if she is looking at me and asking me for a treat, since she is a starving little waif." -- Eleanor L.
"The painting arrived this afternoon and is just PERFECT!!!!!! Thank-you" -- Fran G.
"What a beauty!. It is truly inspirational. It is more delicate than I expected. I love the colors, whites and greens and teal blues. Also, I love how your brushstrokes define the shapes in the flowers and vase. Thanks for being prompt and for your kind note. Keep those emails coming with more beautiful work." --Dale T.
"The package arrived today and I was so thrilled when I opened it. The tulips are amazing and they match perfect with where I hung them. In real life it is so beautiful...I like to just stand and stare at it when I'm home." --Martha S.
"Sunflowers arrived today and they are wonderful, thank you for your amazing work. They're supposed to be a gift for my stepdaughter, but I am going to have a hard time letting go of them." -- Linda R.
"I love it!! Even better in person. Took it straight away to the framers so I could get it on my wall asap. Very happy." --Mary Frances C.
"I enjoy your posts sooo much. You are very talented and your artwork is never bland. Your sunflower brought me sunshine on a cold dreary day. You mix it up all the time with your creativity, which makes it interesting. Your colors and patterns are often rich and bold which I really like." Kate L.
"I hung your cheery little painting right on my kitchen wall facing where I can see it in the morning when I have my coffee! I love it! It is just so cheery and I love that it is just so simply stated (painted so beautifully with such "knowledgeable and confident" strokes!" Irma P.